We finally got the Stanton circle sign off and the Bjava circle up! There weren't a lot of choices for what could work in this space. Needless to say our logo would not work in a circle, well it would have left a lot of empty space in the circle. We could have changed out the circle completely, but the space wasn't available with the what was there. 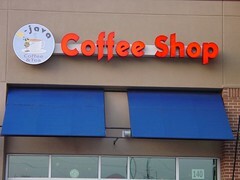 We could have changed out the entire sign including "coffee shop", but the funding wasn't there. So, with a bright light that you can read when you get closer to it, this at least will direct people to the words "coffee shop." I will try to get a better photo of it this week, this one is pretty washed out.